How to Use Redsn0w 0.9.6RC15 to Jailbreak iOS 4.3.3 Untethered? iPhone Dev-Team has just released Redsn0w 0.9.6RC15 to jailbreak iOS 4.3.3 on all supported iDevices except iPad 2. Just like PwnageTool 4.3.3 and Sn0wbreeze 2.7, this build of Redsn0w is based on i0n1c's untethered vulnerability which further uses Geohot's Limera1n exploit to inject the jailbreak. Redsn0w 0.9.6RC15 also lets you to enable custom boot animations and multitasking gestures on your iDevice. NOTE: If you rely on an unlock or want to preserve the current baseband of your iPhone, do not follow this guide otherwise you will not be able to unlock your iPhone using Ultrasn0w 1.2.3. However iPod Touch 4G/3G, 1st-Gen iPad and those iPhone users who do not rely on an unlock can use Redsn0w to get iOS 4.3.3 untethered jailbreak on their iDevices. The guide below is valid for both Windows and Mac OS X users. Launch iTunes and restore your iDevice to stock iOS 4.3.3 firmware. To do so, hold down the SHIFT key (ALT on Mac) and hit the Restore button. Select stock iOS 4.3.3 IPSW which you downloaded in step 2 and leave the rest on iTunes. Once your iDevice has been fully restored to stock iOS 4.3.3 firmware, launch Redsn0w and click on the Browse button. Choose stock iOS 4.3.3 IPSW which you downloaded in step 2 and let Redsn0w process the provided IPSW. After Redsn0w has successfully identified your IPSW file, click on the Next > button to patch the kernel of a firmware. Once kernel has been successfully patched, you will be presented with number of jailbreak options. Choose Install Cydia and click on the Next > button. If you want to enable custom boot logos, choose Allow boot animation (Optional). Similary if you want to enable multitasking gestures on your iDevice, choose Enable multitask gestures (Optional). Connect your iDevice to your PC or Mac vis USB cable. Hold down the Power button to turn OFF your iDevice completely. Click on the Next > button to view the DFU instructions. Now you need to put your iDevice in DFU mode. To do so, hold down the Home+Power button simultaneously for 10 seconds. After exactly 10 seconds, release the Power button but keep holding the Home button until Redsn0w detects your iDevice in DFU mode. As soon as Redsn0w will detect your iDevice in DFU mode, it will go through number of jailbreak steps including Exploiting with limera1n > Uploading first stage > Uploading ramdisk > Uploading kernel and more. If your iDevice gets stuck at any of these steps, follow this guide to set your CPU affinity to 1. Click on Finish button to close Redsn0w. Rest of the jailbreak progress can be seen on your iDevice screen. Once done, your iDevice will reboot itself automatically. I have a iPhone 3GS that I had originally jailbroke using redsn0w and limera1n. It had the original BB on it from when I had purchased the iPhone. Recently I updated my mobile terminal and it caused the phone to go into a loop at reboot. I couldn’t get it to reset or recover. I read in another blog that if this happens you have to use iTunes to recover your phone. I did that and now I have a factory 4.3.5 running BB 05.16.02. I still have all of the original files saved on my computer from the original jailbreak. Is there anyway to get this back to an earlier BB so I can jailbreak it again or am I stuck waiting for iOS 5 BB 05.16.02 to be jailbroken untethered and unlocked? I don’t want to use the iPad BB since this has too many potential problems. Not possible. If your looking for an unlock, then the iPad BB is your only way out & yes, it does come with alot of forever consequences. Also on iOS 4.3.5, your jailbreak will be a tethered one. Restore your iPT2G back to a fresh iOS 4.2.1 & use Redsn0w RC18 / Greenpois0n for your jailbreak. Did you have any SHSH blobs saved for your device on iOS 4.3.3? Either by Cydia (http://bit.ly/qS5bjW) or TU locally (http://bit.ly/n8Kkb1). No.. unfortunately not… is there any way out or did i just “bricked” it? Then you can forget about restoring your iOS to 4.3.3 because w/o a valid SHSH blob, there’s absolutely nothing you can do about it. You might want to read this http://bit.ly/oKCpYX & try your luck to see if Cydia has any saved for your device/iOS. Try restoring to iOS 4.1 custom IPSW instead first because it seems Apple is still signing them. i have downgraded my firmare to 4.3.2 . still i get d error . 1013.
used ireb nw iwas stuck in dfu pwned state mode. nw i boot tethred it works iphone starts finally ! All you did was to force install iOS 4.3.2 w/o any valid SHSH saved for the device on that iOS version. With an invalid SHSH, you cannot expect to have an untethered JB either. Read this http://bit.ly/oKCpYX. I think i killed my iPhone 3gs… i have a 4.3.3 with baseband upgrade to 6.15.00, and for some unfortunate incident my girlfriend pressed reset all ( settings and contents) … the phone when to recovery mode… i tried to recover it in iTunes… and it did not worked… and it’s stuck in recovery mode since then… after that i think i tried everything humanly possible like, red snow, tinyumbrella, fixrecovery43, everything! and nothing works… with tiny o get unable to find fs_mount fs_unmount etc.. with redsnow it does it thing and it reboots to recovery mode.. worst of all .. in tiny de device model is -INVALID. Did you have any SHSH blobs saved for your device on iOS 4.3.3? Either by Cydia (http://bit.ly/qS5bjW) or TU locally (http://bit.ly/n8Kkb1). You probably will need to perform a complete custom restor of your iOS once again. The problem now is that i had accidentally upgraded my 3gs a few days ago when itunes updated the ios to 4.3.5. Since then i have been trying in futile to downgrade to 4.3.3 or to 4.2.1 and simultaneously step up the baseband from 05.16.02 to 06.15.00. If you really do that & your iPhone goes into a recovery loop, there is currently no way to get out of it & hence you will have to ditch it until the iOS 5 is out with a custom IPSW. Take your chances. Perform this only if you have the SHSH saved for your device. 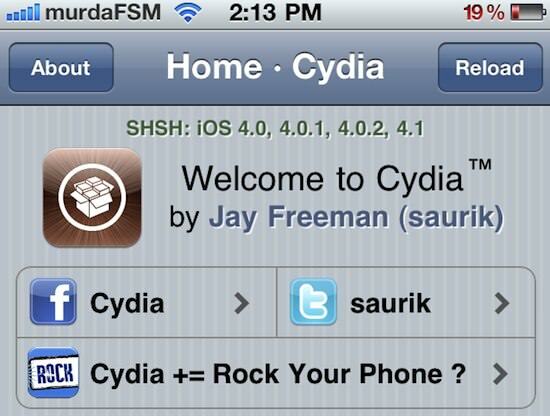 Jailbreak iOS 4.3.5 instead if necessary to confirm the same from Cydia (http://bit.ly/qS5bjW). I used TU to save my SHSH blob and noticed the entries for 4.3.5, 4.3.3, 4.2.1 among others. If i now restore and update my iphone 3gs to stock ios 4.3.5 baseband 05.16.02 what all would i need to do to jailbreak and unlock it. Thanks for your guidance. Don’t even bother to update to iOS 4.3.5. There isn’t an untethered JB solution yet for it & there won’t be as well anytime soon. I unlocked my iphone 3gs with ios 4.2.1 a few months ago. A couple of days ago i accidentally upgraded to ios 4.3.5 baseband 05.16.02 and its locked again. I then used redsnow to downgrade to ios 4.3.3 using ipsw file and at the same time upgrade the baseband to ipad baseband 06.15.00. When redsnow was done the iphone went into recovery mode. I dont even know if redsnow worked. So i tried to kick it out of the recovery loop using tiny umbrella fix recovery. It initiated Greenpoison but i keep getting “init failed” and other error messages like “AND: NAND initialization failed due to format mismatch or uninitialized NAND” and also “AND: Please reformat and so on.. What do i do now? I do not want my phone to get bricked. Please help!! First thing, did you have an SHSH blob saved for iOS 4.3.3 ? Did you confirm this before you attempted the restore either by Cydia (http://bit.ly/qS5bjW) or by TU (http://bit.ly/n8Kkb1)? If this has been mentioned before, I apologize. Incorrect. Your iP4 will still jump back to DFU as soon as you disconnect it from your machine. This is more of a force installation w/o a valid SHSH blob. Insomnia is just an app to keep the iPhone up & running which also will do no good either. Also, this isn’t any kind of temporary fix because you have no valid SHSH blobs because of which the DFU loops occur. I have a question and it might be silly, but here it goes. I want to jailbreak my iphone 4 4.3.3 . My phone is full of pictures and contacts etc. Will I loose everything when jailbreaking it using Redsnow? Because I have to download the stock 4.3.3 file etc. No it will not remove any of your personal data/settings. But its always advisable to first make a backup in case anything goes wrong & then jailbreak your device. my device is a 3G ipad 1, bought it from UAE on october 2010. I dont know stuff about band unlock and ultrasnow stuff, i read warnings about it everywhere, i bought my ipad unlocked already cuz am not in the US obviously. btw, if i load the custom firmware to redsn0w tool to boot tehtered only or anything, it returns “invalid firmware”! i downloaded pwnage tool 2.0.1 but it’s just couple of folders with so many files…i dont know how to use it!!!!!!!!!!! i never used SHSH blobs but i hear a lot about them. Which version of iOS did you try jailbreaking at first using RSrc15? Make sure that you have/had the SHSH blobs saved for your device on 4.3.3/any other device in Cydia (http://bit.ly/p07pX2) or by using TU (http://bit.ly/n8Kkb1 with these settings http://bit.ly/qqFuve set). Update to iOS 4.3.5 & jailbreak if necessary to see the saved SHSH blobs on Cydia. Redsn0w isn’t a tool that’s used for restores, so you can’t point your custom IPSWs there & Pwnage is for the Mac. i’ve done everything in ur article so far 5 minutes ago… the jailbreaking process bar on my ipad screen has been stuck for few minutes on “installing bundles” and the picture of the running pineapple… is that normal? Which iPad version? Your iOS details & what are you trying to achieve? Please explain them in detail to be able to help you & others here. Hi, still newbie here, please need a guide. the issued is, now i can’t sync app on my phone from iTunes, but i still can sync music. i want to sync all my app i downloaded and erase all the old one that the store installed. can i re-jailbreak by myself using redsn0w_win_0.9.6rc19 (os: 4.3.3)? my phone kind of getting slow respond now. Assuming that these are jailbroken apps that your trying to sync to your iPhone with, this is not an issue with your jailbreak. You need to install the necessary jailbreak tweaks to perform such tasks. Install AppSync & then perform the sync. Read http://bit.ly/pbCS8A. pramod idid wat u told me to do but now after the rebootin itself its stuck on the apple logo for past 10 mins …. Rerun Redsn0w, this time with the Just Boot Tethered Right Now option & Cydia (if you want a jailbreak). Remember that you will always need to redo this step each time you switch off your device. This is why I had asked you first if you/any of your friends have the official carrier SIM to which it was locked to, because if you had one, you need not do any of these steps at all. i have factory unlocked iphone 3gs.tried installing custom firmware 4.3.3 but fails.If i update it to original 4.3.5 will i be able to activate it without original carrier sim.i don’t have original carrier sim and now iphone is in dfu loop. That means your iP3GS is not a factory unlocked iPhone. Do you rely on an unlock because of which you had to update your BB to an iPad’s BB? The image link that I just gave definitely works. See this. You need to have the iOS version to which you wish to update/restore listed like this on Cydia. All you can do right now is to wait for the iOS 5 untethered jailbreaks. For starters, only if you have an SHSH blob saved for iOS 4.3.3 will you ever be able to restore to it. So make sure first if you have iOS 4.3.3 listed like this http://bit.ly/p07pX2 for you on Cydia. thank u. should i remove the turbo sim when i will restore later? Yes, its always better that way to avoid unwanted issues. THX a bunch. This worked perfectly. Had a 3GS with 4.3.3 iOS and 5.16.2 baseband. Upgraded to 6.15. baseband and unlocked using sn0wbreeze, then I used redsn0w to unlock it again. Now works perfectly. My ipad has gone on a permanent DFU mode loop. Added to that is, the screen does not show up. Only sound. I tried everything , no use. Anyone in the same boat ? recovered ? Please explain your issue in more detail to be able to help you in a much better fashion. A DFU loop & iPad alone won’t help. Explain what version & how you got here in the first place in detail. Hi. I’m using iphone 3gs i put 4.3.3 ios and phone get locked in DFU mode. I follow your instructions and retry with version RC16 and RC18 but i stuck on messages on iphone showin “Please wait…” printed for ever on screen phone. Any idea to fix this? (in windows, redsn0w.exe program ends normally). By put if you meant that you restore your device to iOS 4.3.3 using TU, then you cannot do so unless your having an SHSH blob saved for your device on Cydia for that version to which your trying to restore to. Read this http://bit.ly/pUDssX. hi I’m using gevey turbo unlocker….can i jailbreak my iphone 4 (4.3.2) without removing the turbo sim? Yes, you definitely can, but it isn’t going to hurt if you remove it as that avoids unwanted issues & unknown errors. Don’t try using iReb. Use Redsn0w instead to put your iPT into a Pwned DFU mode and then try the same. Read this http://bit.ly/pioV9v. Do not use Redsn0w for anything else & also allow the device to come back up alive on its own after the restore from iTunes. when i get close to the end of jailbreaking my ipod it gets stuck at the connect to itunes screen buh when i do that i have to restore my ipod again… what do i do? More details such as iPod model & the current iOS version running on it would help. I am about to Jailbreak my 3GS with 4.3.3 BUT has a factory configured unlock, ie is “Sim Free”, so am using Redsn0w. In the instructions it stipulates iTunes 10.2.2 is this paramount to the procedure or can I use the version I currently have installed “10.3.1.55” which is the latest version ??? Yes you can very well go ahead and use the latest version of iTunes w/o any issues. All good, the Redsnow did the trick and my Gevey still works fine to unlock it. Hoping you can help J.
I was using a locked Iphone 4, Jailbroken with Gevey, running 4.3.1 and thought I’d upgrade to 4.3.3 and then go to jailbreakme.com, all thanks to a friends suggestion. Upgrade obviously worked however the jailbreakme download kept kicking me out half way through. I then read some posts that I needed to restore it in order for it to download, however I’m now stuck on the Emergency screen since I don’t have the right SIM as it’s locked to another carrier in another country. I tried the PwangeTool as I was worried about RedSnow due to the warnings regarding unlocked phones however it too gets me the same result. Emergency screen and no where to go. While creating a PwnageTool custom IPSW, you must also tick the Activate the iPhone option from the General tab. Recreate your IPSW and restore to it. You’ll be good to go. Now that your using PwnageTool, there is no point in using JBMe3 again because PT will by default jailbreak your iDevice as well in the process. So, you can skip JBMe3 anyways. I think I have the same problem. I jailbroke it but the SIM card I got in Europe doesn’t work in the iphone 4 I got in the USA. So you suggest that we use Gevey SIM imposer? Are there instructiuons for it? Thanks a lot for your help. Yes, Gevey is the only way to get your iPhone 4 unlocked. The instructions are the same for all the Geveys out there and make sure you buy the Gevey Ultra original one as its the best out there. The instructions on how to use a Gevey Ultra can be found here http://bit.ly/jiao34. I need help to get the network working. Had the phone jailbreak with Redsn0wRC16 but still no carrier network. Redsn0w is only for jailbreaking and not unlocking. Right now, you can unlock your iP4 only by using the Gevey SIM interposer. There is no s/w unlock available yet for the iP4. I followed your method. But now When I try to put the new sim card which i want to use , itunes show Sim not supported and I dont see network in Iphone either. Are you Syncing your iPad to a previous backup just after the Restore? If so, do not do so as there might be something in your backup that’s causing this issue. How does the Slide To Power OFF functionality work when your set it up as a new iPad. Set it up as a new iDevice w/o restoring from an exisiting backup then jailbreak via Redsn0w. Work fine before I jailbreak. thanks for your help. This site such a good one. Use Sn0wBreeze instead if RS isn’t working for you. Create a custom restore IPSW and restore to it. Follow this guide for Sn0wBreeze http://bit.ly/mbFORU. Restore from back up. No I did not. Would you please show me how to do the fresh restore? With full instruction. Yep, Shift+Restore is the right way. How does the Powering down functionality work before you jailbreak? Try it out and let me know. I jailbreak ipad 4.3.3 with untethered redsn0w 16. my question is when i hit side to power off then power on, system crash also have white contact and maps icons and when i press on any icons it’s reboot it/s self. I restore and jailbreak and side to power off and on same issue. Please need help? Thanks for reading my issue. Do a complete fresh restore of your iPad on iOS 4.3.3 & re-jailbreak using the latest Redsn0w RC18 from here: http://bit.ly/lMeWpa. It should work just fine then. Did you sync with an existing backup after the fresh restore? If so, do not do it. See how the Powering down functions before you sync with your backup. im succesfully Jailbreaked my iphone 3gs,..
and now its my frist time using cydia.. when frist time i use cydia, there is any question, who you are ? what must i choice, user, hacker or developer ? You can choose Developer. They are simply search filters on the basis of which results will be returned to you. I am a bit confused. On May 9, you answered a question and told the person that if they rely on an unlocked phone that they should use sn0wbreeze. However, on the sn0wbreeze instructions on May 7, you told the person that if they are a factory unlocked user that they should use Redsn0w. I bought my phone locked to a carrier in Korea. However, that carrier unlocked it for me. Which jailbreak should I use so that I can keep my unlock? Different scenarios calls for different set of tools requirement for a jailbreak. If you have read their comments, they differ in the way their iPhones are unlocked – factory unlocked/not factory unlocked. In your case, if your carrier has unlocked it for you, then you belong to factory unlocked scenario wherein you need not worry about BB preservation or anything of such sort. Go ahead and use Redsn0wRC16. Download it from here: http://bit.ly/kOhAeX and follow the same instructions as above by substituting your IPSW with the one shown in the guide. Beautiful. Thanks for that. My confusion was understanding the different unlock terminology. Well, I followed your instructions to the T. Everything works perfectly. My carrier unlock is still good and I have a jailbroken phone. Thanks for the tutorial. Couldn’t have been easier. I attempted to install Redsn0w on my 3GS. It gets all of the way through and says “rebooting” be does not reboot. What should I do? Download the latest Redsn0wRC16 from here: http://bit.ly/kOhAeX & redo the jailbreak procedure. I just jailbreak using RC15 without tick the optional allow boot animation. How can I change the setting and allow the boot animation been active without redo the jailbreak again. Still does not work, thinking to redo the jailbreak again after do backup. which backup package worth to try? Ohh Yes. Sorry. My bad. You’ll need to redo the Redsn0w JB to Enable Animated Boot Options but this time, without checking the Install Cydia option. I dint get you there. What did you mean by Backup Package? You don’t need to backup at all. You can go ahead and redo the JB w/o any issues. I had my ipod touch stuck in recovery mode loop on 4.3.1 trying to jailbreak it with sn0wbreeze. So I downloaded the current stock fw from apple and tried this guide. What firmware is it supposed to show on my settings once the processing bar with the running pineapple is done and my ipod reboots? It says 4.3.3 (8J2), which is the stock fw. Ok, nevermind. The Cydia app is there hehe. Yes, it is supposed to show 4.3.3 as your Firmware Version itself. Nothing will change. I dont seem to find the ipws on my folder…it shows not mact find…?any idea? You’ll need to download the respective IPSW seperately for your iDevice. I had a locked iPhone 4 (At&T, 32 GB, iOS 4.2.1, BB 03.10.01). I jailbroke it using greenPoison. Then I used a normal Gevey Sim to unlock it on the same iOS and baseband. Now, I have upgraded my iPhone to iOS 4.3.3 from iTunes itslef, without downloading the IPSW file. Then, using your GODLY guide, I unlocked it using that same Gevey Sim (BB is 04.10.01 now). Now it seems the jailbreak has gone away or something. What should I do to jailbreak it? I don’t have the IPSW for iOS 4.3.3. Should I download it to use redsnow, or is redsnow itself not suitable since I use a carrier unlock? A step-by-step guide would be very good. And also, I haven’t lost any data yet. Will the jailbreak do anything to my photos/songs etc? By using the Gevey SIM, you haven’t yet jailbroken your iPhone 4. If you have updated your iPhone via iTunes, you’ll be able to find your IPSW in the below location. Yes it is, but as long as you bring it back to the US Apple Stores to get it checked. The Apple Stores in India will not help you with your Home Button problem since you did not buy your iP4 from India. Is it a common problem, because my friend faced it too, but it started working properly after some time, on its own? And its weird that they don’t offer an international guarantee. And yes, what resort do I have now? Road-side mobile vendors? i did exactly how you said,but still getting itunes error 1611!!!! however, i can use redsn0w or iReb, always getting itunes error 1611! i am not able to restore on cfw 4.3.3……. i tried to jailbreak after itunes error 1611, it is going great till the jailbreak has to go on on my phone (device)… i see data running and suddenly it breaks up, screen going black!!! i tried to use fixrecovery 43 after unsuccesfull restore and jailbreak, gives me the same problems with unable to…. i described in comment above…. i do not know what the hell is wrong with this phone. i cannot get out of this f**king recovery mode!!! Go to iTunes -> Help -> Run Diagnostics and tell me if you see all tests passed? Make sure your iPhone is connected to ur PC. tried this solution, http://bit.ly/lmdPdm ,but gives me itunes error 28, at least when i do it this way it’s the first time i see the sn0wbreeze log with loading bar (not processing)!!! Ok… I think Waiting 5-6 days won’t Change anything!! so is it Sure that i have Battery issues or is it possible that i have other Hardware Problems!! Hey man, still Stucking in Rec Mode in 3Gs New Bootroom 4.4.3 iReb Not solving iTunes Error 1611!! Know a Solution for this?? Compare your results to fix recovery screenshot in the end here http://bit.ly/myffI3 Also which version of fix recovery you are using? This i See in the Device when using fixrecovery 43!! In a Few hours i can give you a Screenshot, but i think it Looks exactly the Same which you linked me to!! Your iPhone 3GS has iPad baseband and you restored iOS 4.3.3 CFW successfully? You got 1611 error even after you used standalone version of iREB? Ok. Do this: Create iOS 4.3.3 custom IPSW using Sn0wbreeze but with “Baseband Preservation Mode”. Once done and restored, your iPhone will get stuck in recovery loop but it will be on stock iOS 4.3.3 (Unjailbroken). You need to follow the above guide to jailbreak it. This will definitely work. I can jailbreak the Phone when it is in Recovery Mode?? And when ut is jailbroken fixrecovery 43 is working to get the Phone out of Rec Loop Mode?? Yes, you need to put your iPhone from recovery to DFU mode. Also you will not require fix recovery because Redsn0w will kick your iPhone out of recovery as well. 3. Restore CFW using iTunes (It should restore without any error i-e 16xx) After CFW restore, you iPhone screen will be black i-e It will be in DFU mode. Leave it in DFU. 5. Phone will kick out of recovery and will jailbreak it. If not use fix recovery 4.3! Do you have a idea how to Jailbreak AND Unlock it? May GOD give a boss like yours to everyone :D Well, you can use the above guide to jailbreak your iPhone but as you also rely on an unlock, so you must upgrade your baseband to iPad baseband. Upgrading to iPad baseband may lose you GPS functionality. Just use the above guide and choose “Install iPad baseband” in step 6. Once done, you can unlock it using Ultrasn0w 1.2.3. I unlocked & restore (version 4.3.1) iphone 4 using snowbreeze, now can i upgrade my version to 4.3.3 using Redsn0w 0.9.6RC15??? hello, i accidentally press the update instead of restore when jailbreaking and so my iphone already in 4.3.3. can i still jailbreak using the redsnow RC15? thanks a lot. thank you.. or should i use the updted version RC16? It is always recommended to use the latest available version! thank you very much for assistance. well appreciated. Thanks Wolverine for the detailed explanation and it really helps! I think I did not really backup all before starting the restoring process, so lost the photos, videos… But apps, music and contacts can still be restored as backup were just applying to them. I also backed up shsh blobs based on your post, at least it’s safe to do so… thank you very much to bring us a safe and effective environment to jailbreak iphone so that we can enjoy it with so much fun! When restore the iDevice to stock iOS 4.3.3 firmware, got restoring error message: 3194. How to fix it? Remove everything from your Windows or Mac HOSTS file. This will fix this issue! 1. you have to run Notespad as administrator in order to chance hosts file. 2. After hosts file is changed, you have to reboot your PC. After jailbreaking your IPhone, and when there is a newer IOS released from Apple, we will have to upgrade to newer Apple IOS via restoring process, and re-jailbreaking it, correct? The restoring process seemed to wipe off all data from your IPhone to factory setting, so another lesson learned is: backup all data – calendar, SMS, contacts, applications (official or cracked), apps data, and cydia installous app, etc… I think it should be useful to remind people to do this extra step before going through this newer IOS jailbreaking process, correct? Or maybe i did something not correctly, and there is some other ways to upgrade your old jailbroken IOS to the newer Jailbroken IOS directly without losing anything configuration on your IPhone? Still have some questions for the SHSH backup usiing tinyumbrella. What time should we do that: before the jailbreaking, or after the jailbreaking? I understand if we don’t do that, we will not be able to restore to the older IOS version, but why i need to downgrade the IOS? I like to keep the IOS updated all the time, right? so I still can not get the point to backup the SHSH urgently… Can you help to explain further? In my own case, I jailbroke IOS 4.3.2, and now used this process posted here to restore Apple IOS to 4.3.3, but unfortunately lost all data (this step disappointed me a little bit). Then re-jailbreak it to 4.3.3, and had to restore all apps through iTune, and manually reinstall Cydia installous apps. in this case, the whole process took about 3 hours. Is there anything effective way to keep the apps and data when re-jailing the newer IOS? or did i do anything incorrectly? Appreciated a lot for the kind help! Yep, whenever Apple will release a new firmware, you must restore your iDevice completely. You can always create a backup of current data using iTunes tho. As far as restoring iPhone firmware without losing any app is concerned, it is not possible until you create a full back-up of your iDevice. Restoring the backup will restore all emails, messages and contacts you had before restoring. This is the right time to save iOS 4.3.3 SHSH blobs. You don’t need a jailbroken iPhone to save SHSH blobs. Also you don’t have to be on that firmware to save its particular SHSH blobs. SHSH blobs are used for downgrading purpose and people downgrade because sometimes they are not satisfied with the latest firmware. Apple is signing iOS 4.3.3 SHSH blobs now, you can save it now. When Apple will release iOS 5 or iOS 4.3.4, you will never be able to restore iOS 4.3.3 on your iDevice until you have SHSH blobs for it. Why you would like to downgrade? Because you may find iOS 5 laggy or you may not feel comfortable with the battery life on iOS 5. As far as last question is concerned, iTunes is well-capable of backing up your SMS, Contacts, Photos, Music, Emails etc. So before restoring a new or same firmware again, do backup your iPhone first using iTunes. Restoring the backup only takes 5-10 mins.